Crooked Creek Horse Park is one of the most beautiful places to take your family, friends and horses in western Pennsylvania. There are approximately 30 miles of permanently marked trails. Our most popular trails are out and back but and to get a loop would require back roads and a considerably long ride of 20 plus miles. Our trails are challenging for the experienced riders but not too difficult for the novice riders. 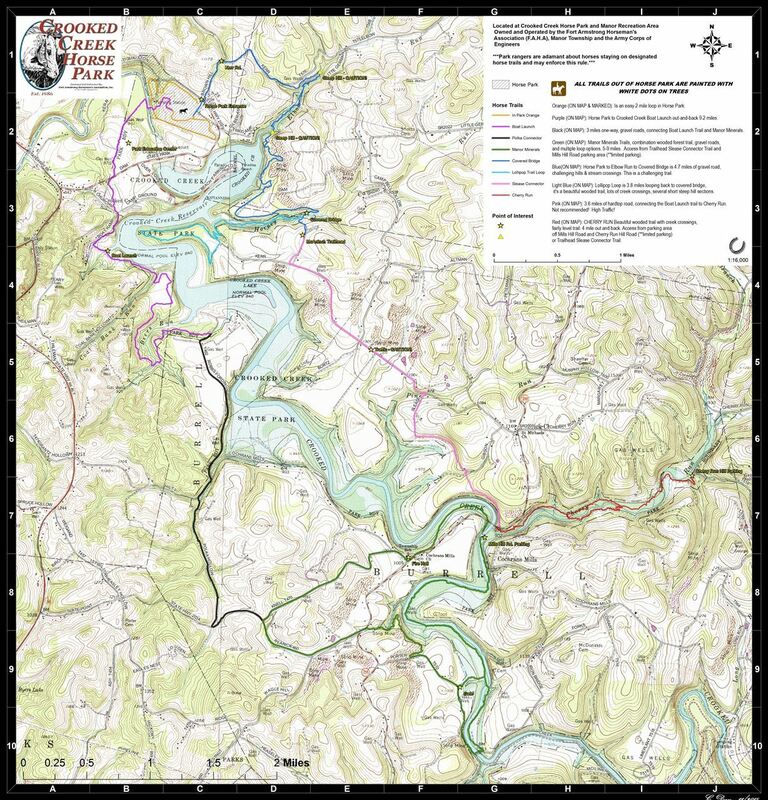 Trail maps will be available soon for your purchase in the office. There are no horses available for rent. Recently we had to close our Manor Minerals and Cherry Run trails to repeated extremely wet seasons resulting in multiple flooding events. In 2019 and forward if we can obtain volunteers to help assess and reopen these trails we will be able to provide riders with some truly awesome trails. Below is a map of our current trail system. The arrows on the left top of the embedded map will open the legend providing more information. You can download a copy of the map using the link below or you can buy a copy of the map when joining or renewing your membership. Maps are also available for sale online or during FAHA club events. We are working on getting all our trails into various apps so that you can follow along as you ride. Major improvements are needed to many of our trails. We are looking for volunteers all the time. Email crookedcreekhorsepark@gmail.com if you wish be included in our trail maintenance group or adopt a trail. For more details on each individual trail see the individual trail pages. If the trail is available on an app, it will be posted in the individual trail page.